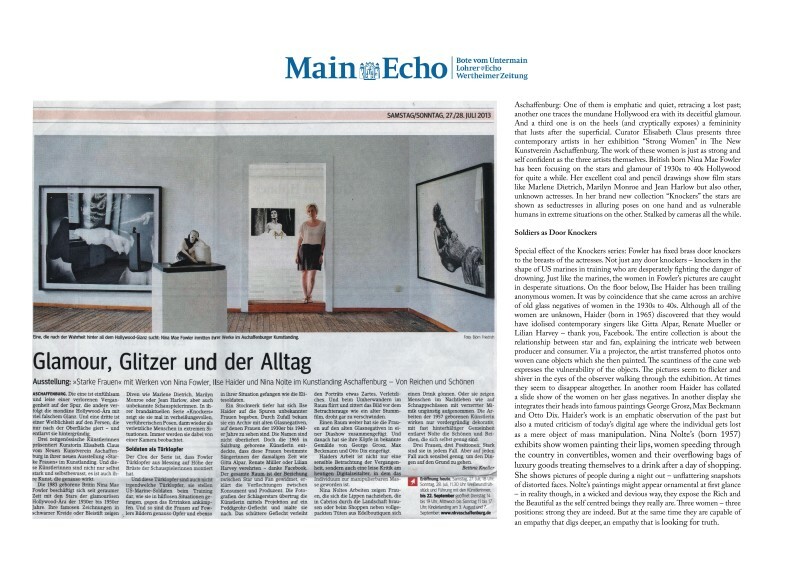 Exhibition: "Strong Women" with works by Nina Fowler, Ilse Haider and Nina Nolte in The New Kunstverein in Aschaffenburg - About the Rich and the Beautiful. Aschaffenburg: One of them is emphatic and quiet, retracing a lost past; another one traces the mundane Hollywood era with its deceitful glamour. And a third one is on the heels (and cryptically exposes) a femininity that lusts after the superficial. Curator Elisabeth Claus presents three contemporary artists in her exhibition "Strong Women" in The New Kunstverein Aschaffenburg. The work of these women is just as strong and self confident as the three artists themselves. British born Nina Mae Fowler has been focusing on the stars and glamour of 1930s to 40s Hollywood for quite a while. Her excellent coal and pencil drawings show film stars like Marlene Dietrich, Marilyn Monroe and Jean Harlow but also other, unknown actresses. In her brand new collection "Knockers" the stars are shown as seductresses in alluring poses on one hand and as vulnerable humans in extreme situations on the other. Stalked by cameras all the while.